Billions of dollars of income from the agriculture with thousands of jobs in the sector, this is US Midwest. Hundreds of no-nonsense techno releases by a bunch of artists, this is US Midwest – if we only think of Woody McBride, DJ Slip, Mike Henk and others. Now two influential 1990s quarterbacks have returned to the pitch and cheer up the raving community with a strong four-tracker on Sunil Sharpe’s Earwiggle imprint. 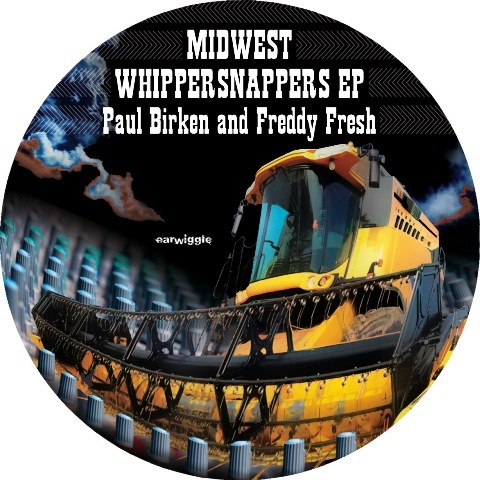 Freddy Fresh and Paul Birken have not lost any skills over the time and introduce the EP with “The Fate Of Thirty Eight”, a gritty analog assault with plenty of distortion and electrifying effects. Even more ruthless is Birken’s solo in “Acid Youth Of Malibu”, a faster version Edge Of Motion-style distorted techno going to the very top of this year’s floor destroyers. Brute bass and lunatic acid lines make it an efficient tool for any techno DJ bag. Another teamwork called “Fifty Is Shifty” offers brisk 808 driven madness, clattering and whizzing like Bunker and Acid Planet once did. After being hunted by giant harvesters some shelter is provided in the last track, “Years Back” by Fresh, originally released on his 1998 album for Eye Q. Lifting off towards darkening skies we gradually move into the embrace of beautiful atmospheric pads, good for spilling some tears. All in all a very impressive job.